12.73 acres of unencumbered land adjacent to Cabela’s at St. Louis Outlet Mall and Park 370. 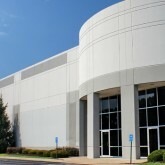 Zoning allows for a wide array of permitted uses from light industrial to retail. This state–of–the–art distribution center contains 32’ ceiling heights and ESFR sprinklers and is located in one of the Midwest’s premier industrial parks with high visibility from Interstate 70 and 10 minutes from Lambert–St. Louis International Airport. Built in 1929, this elegant 11 story apartment building, adjacent to the Park Royal Apartments, is on the National Historic register. Under our ownership for over 40 years, the units have 9 feet ceilings and up to 1,900 square feet of living space. Built in 1930, this magnificent 16 story apartment building, adjacent to the President Apartments, is located in the heart of the Central West End. With apartments up to 2,200 square feet, the apartment homes have 9 foot ceilings and parquet floors. This unique three story commercial building is located in the County Seat of Clayton, just one block from Metrolink, MetroBus Center and its 1,200 parking garage, and directly across the street from the St. Louis County Court and Government Center. Located at a signalized intersection with an Electronic Message Center, Maple Hill’s location in South County is firmly established. Colonial Square is conveniently located 2 miles East of Lindbergh Blvd. on Manchester Road between Brentwood and Lindbergh Blvd. With over 500,000 square feet of commercial businesses within a half mile radius, Florissant Plaza sits at a key intersection with excellent visibility on a major arterial carrying over 55,000 cars per day. With over 1,200 feet of frontage along Olive Boulevard, one of the County’s major east–west corridors carrying over 45,000 cars per day, Olivette Center has excellent visibility and demographics. With one of the largest Electronic Message Centers for a center its size, Concord Plaza has six entrances from two streets. With over 1,500 feet of frontage on a major arterial carrying over 55,000 cars per day, Florissant Meadows occupies a key location in the shopping district.